When most of us think of summer skiing, glaciers are usually the first places that pop into our minds. 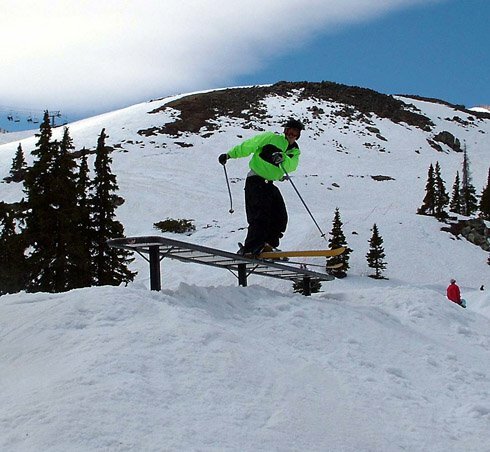 This summerÃ¢â‚¬â„¢s first ski camp, however, took place at ColoradoÃ¢â‚¬â„¢s Arapahoe Basin. There, the Boulder-based Jibij Pro Shop hosted four weekend session camps coached by members of the storeÃ¢â‚¬â„¢s team. Coaches included Dan Broadbent, Mike Broadbent, Chris Garcin, Jon Hartman, Chris Myers and Steph Myers. And, what a way it was to kick off summer skiing. I caught up with the crew on Saturday, May 28, the final weekend of camp. Fifty to 60 degree temperatures were accompanied by bright sunshine most of the day. Clouds rolled in when we broke for lunch at around 12:30, and it flurried for quite a few minutes. Snow in the end of May is rather scary. The afternoon, however, was filled with sun and some impressive skiing highlighted by DanÃ¢â‚¬â„¢s 900 on the flat box. Coaches and campers alike were throwing down, showing how much fun and learning could be had in the park. 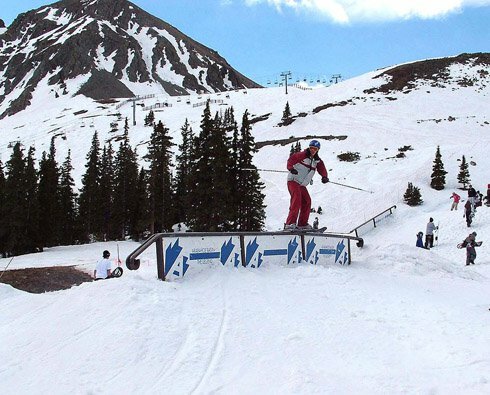 Features included a hip jump, a small table, a 20 foot flat rail, a shorter flat box, a 10 foot down rail, a flat-down box, and, while not in the park, a pond skim which attracted much attention. HereÃ¢â‚¬â„¢s how it all startedÃ¢â‚¬Â¦ Josh Bryant, the owner of Jibij, wanted to run a camp that everyone could afford. Ã¢â‚¬Å“When I was a kid, my parents never sent me to a camp because of the price,Ã¢â‚¬? he said. Ã¢â‚¬Å“There are tons of kids in Colorado facing the same thing.Ã¢â‚¬? The camp cost $150 for two days of skiing, including lunch and some free schwag. Ã¢â‚¬Å“At our camp, you only come on the weekends, and you can do as few or as many as you feel like,Ã¢â‚¬? he said. This is what keeps the price low, opening up the chance to get high quality coaching for a lot of kids. In its first year running, only Colorado residents participated. Josh is working on some alternatives to make the camp a viable option for skiers out of state. He is looking into making lodging available as well as hosting sessions that last a week, rather than just a weekend. A-Basin was relatively lax when it came to actually setting up the camp. Ã¢â‚¬Å“I contacted the management and told them what I wanted to do,Ã¢â‚¬? said Josh. Ã¢â‚¬Å“They were all for it. They didnÃ¢â‚¬â„¢t have a lot of guidelines in place. We just had to get all the insurance taken care of.Ã¢â‚¬? Josh and crew also had to lug a tent and all of their Line demo skisÃ¢â‚¬â€?available as part of the camp packageÃ¢â‚¬â€?up and down the mountain everyday. Each session had about 12 campers and six coaches, so the camper to counselor ratio was excellent throughout. 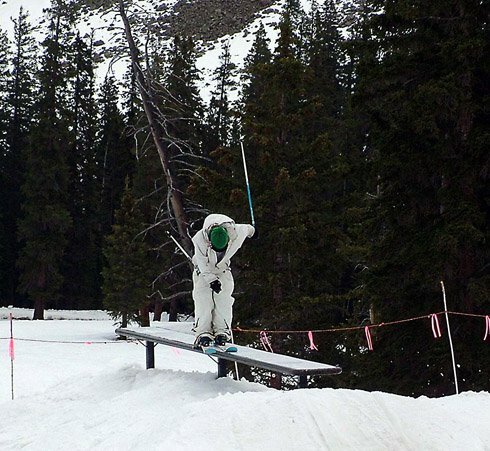 Camper Jon Fleury believes this allowed him to improve his skiing. 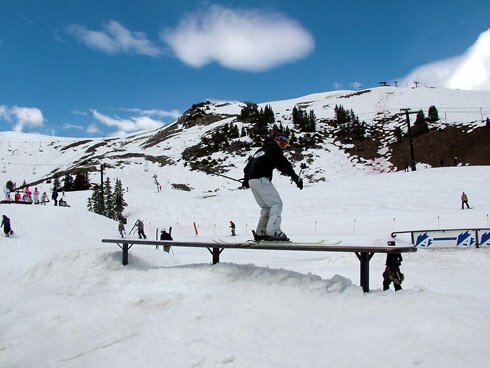 Ã¢â‚¬Å“I learned 7s and switch ups on rails,Ã¢â‚¬? he said. Ã¢â‚¬Å“It was great to ski with so many good people and have so much time with the coaches.Ã¢â‚¬? Having this time with the coaches was indispensable. Ã¢â‚¬Å“ItÃ¢â‚¬â„¢s cool to work one on one with the coaches,Ã¢â‚¬? said camper Nikki Inglis. 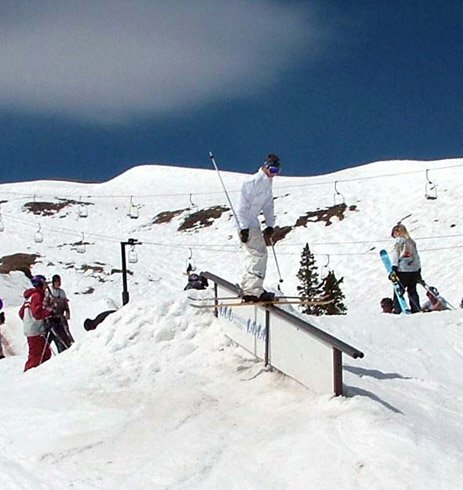 Ã¢â‚¬Å“There are rails IÃ¢â‚¬â„¢ve hit today that I have been too scared to hit all season. Watching Steph do it made me realize that I can also do it.Ã¢â‚¬? Coaches also liked the setup. Ã¢â‚¬Å“It has been really fun and itÃ¢â‚¬â„¢s cool because the kids really look up to you,Ã¢â‚¬? said Steph. Ã¢â‚¬Å“All the kids are progressing a lot.Ã¢â‚¬? Steph believes that this setup was ideal because, Ã¢â‚¬Å“If you have someone telling you how to do a trick, you learn faster than if you just went out and guinea-pigged.Ã¢â‚¬? Further, Ã¢â‚¬Å“having someone pushing you makes you more likely to try stuff,Ã¢â‚¬? she said. Josh was pleased with how the camp went and the opportunity it gave the campers. Ã¢â‚¬Å“The best thing about the camp was seeing all the campers progress and actually get to ski with a group of like-minded skiers,Ã¢â‚¬? he said. Ã¢â‚¬Å“Most of the campers never get to ski with anyone else who rides park, so it was great to see how much that helped them.Ã¢â‚¬? 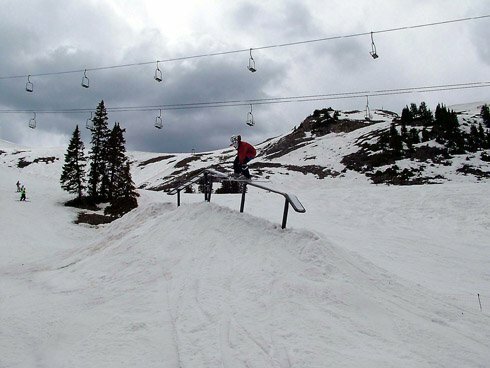 He would like to give shout-outs to A-Basin, Rob Brown at Line Skis, Siver Cartel, Orage, Jiberish, all the coaches and especially the campers who came and made the camp a huge success.